I'm in an Etsy Treasury! 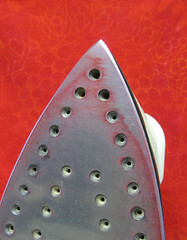 Don't use your good iron, because you will probably get paint on it. I have an iron reserved for craft use (fusible webbing, image transfers, etc). 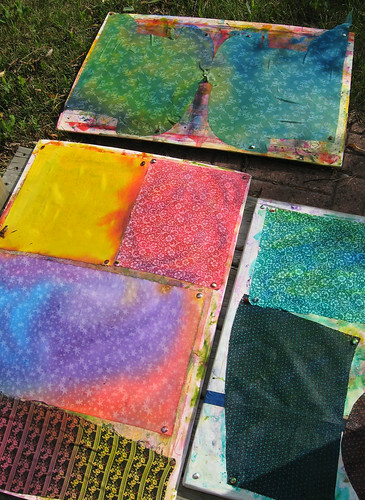 I also covered my ironing pad with blank newsprint so I didn't fuse paint to that either. 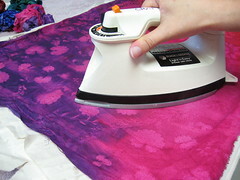 I'm not a very enthusiastic ironer (is that a word? 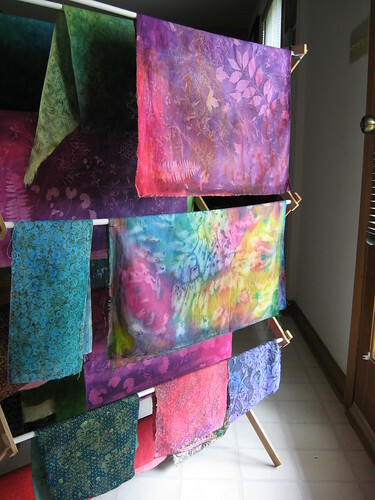 ), so my fabric was still slightly damp when I decided I was finished, and I hung it on a drying rack. So that's all done, phew! And now I have some new fabric to play with! 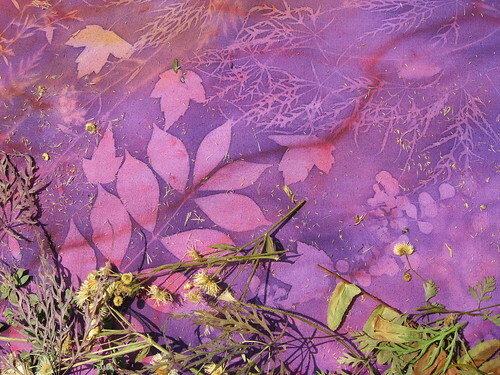 After last week's blog post about fabric painting, I managed to do a little sunprinting on Saturday. "Sun printing" is a bit of a misnomer because apparently it's not the light but the heat that causes the effect. 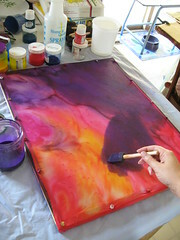 The faster the paint dries, the brighter or darker the color sets. 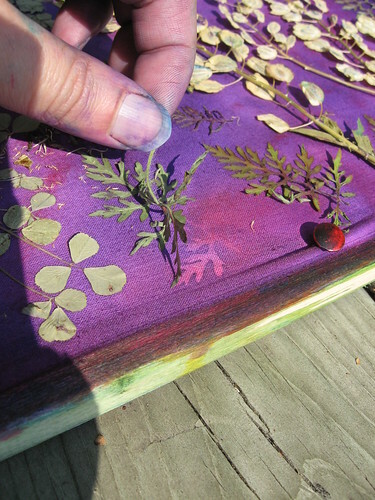 The paint underneath the objects (leaves, washers, doilies, etc) dries slower so the color is faded. 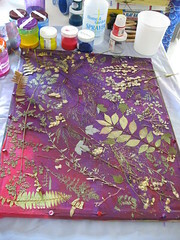 I took the fabric I had salt-printed (if that's a term) on Friday, which was still stretched on a frame, and painted over the whole thing in purple. Then I laid out leaves that I had pressed in a phone book and put the whole thing outside to dry. Here's a Setacolor Soleil sun-printing tutorial at the Michaels website, though as I mentioned last week, the Michaels stores near us put all their Pebeo Setacolor fabric paints on clearance earlier this summer and don't carry it anymore. 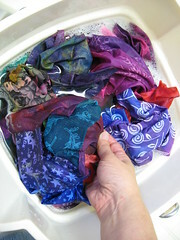 I mix my fabric paint 1:1 with distilled water. Here's a tutorial from Simply Quilts about the salt technique. This was from an episode featuring Indiana quilt artist Phil Beaver who does some amazing applique with his hand-painted fabric. 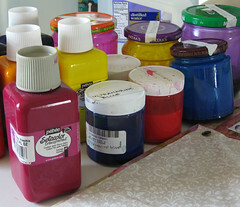 I like to use the Pebeo Setacolor (transparent color) fabric paints, which work well for sun-printing. (Our Michaels store used to carry them, but it all went on clearance earlier this summer, which at least let me restock my supplies.) 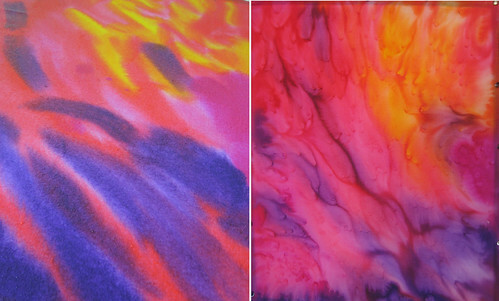 You can see some examples of sun-prints in my Fabric Painting set on Flickr. On Wednesday, it became too cloudy and humid to get a good sun-print effect, so I focused instead on jazzing up some boring fabric. The unpainted fabric visible next to the paints above was a white-printed beige cotton fat quarter. 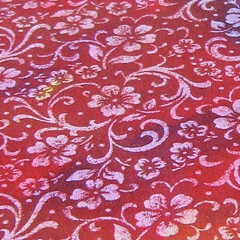 The white design somehow acts as resist, and when you paint over it in a bright color like red, the pattern just pops! I also experimented with some fabric scraps from a friend who makes vintage-style clothing. This pale green fabric needed some stronger color, and it was fun to discover that the floral pattern on it also stood out when painted a brighter green. Now when's my next free sunny day??? I haven't been very good at keeping up with Fiber Arts Fridays this summer, but a couple of weeks ago, Alpaca Farmgirl suggested sharing pictures of our fiber stashes. 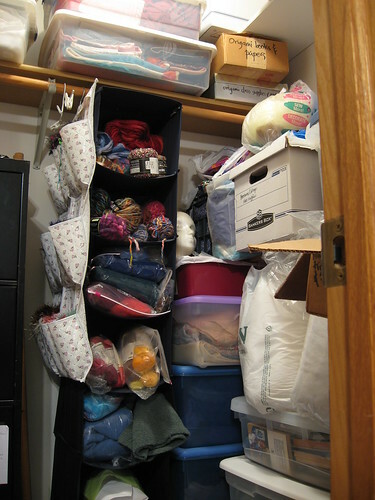 Above is my yarn storage, and if you click on the link to my Flickr, there are notes on the photo explaining what's what. I don't have any fancy handspun to show off, because most of my variegated wool yarn was bought on store-closing clearance. 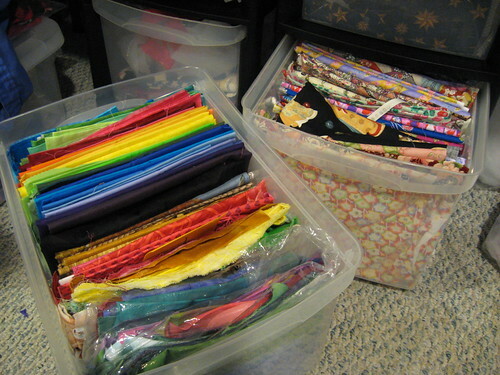 And I mainly use it for ATC borders and my rare bouts of needle-felting so one skein will last me for years! If I'm actually working on a project, they don't look this neat. I have larger pieces folded or on bolts in the hall closet, but that's a photo op for another day! 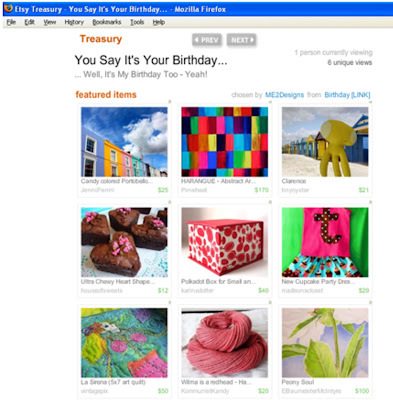 Thanks to fellow birthday girl Meg at ME2Designs, I'm in my first Etsy treasury where I'm not an invisible alternate! What a fun birthday gift (and from a complete stranger)! My featured item is my La Sirena mini-art quilt. I'm celebrating my birthday today by doing several loads of laundry and cleaning in the morning and then taking a workshop on making "Interlocked Double Accordion Books" in the afternoon at the Bay View Book Arts Gallery. My husband took me out to dinner at La Estacion last night (a great Mexican restaurant in an old train depot) so tonight we'll have leftovers and lounge around watching all our DVR'd TV shows from the week. Such excitement!